Trump said he would welcome Andrew Brunson who has become a cause celebre for the US leader’s conservative Christian base — at the White House shortly after arrival. On Friday, a Turkish court in Aliaga convicted Brunson on charges of espionage and aiding terror groups. It sentenced him to three years, one month and 15 days in jail but released him based on time served and good behavior. Trump administration officials have said Brunson had “done nothing wrong” and that the charges were politically motivated. Trump thanked Turkish President Recep Tayyip Erdogan for his help on the case, which caused not only a serious diplomatic row between the NATO allies but led to a crash in the lira, exposing Turkey’s economic fragility. “Pastor Andrew Brunson, released by Turkey, will be with me in the Oval Office at 2:30 PM (this afternoon),” Trump tweeted. Trump again denied an NBC report that Turkey and the United States had reached a secret deal for the 50-year-old Brunson to be released in exchange for the US easing “economic pressure” on Ankara. “There was NO DEAL made with Turkey… I don’t make deals for hostages,” Trump said on Twitter. Brunson, who was first detained in October 2016, faced up to 35 years in jail. Prosecutors then demanded a sentence of up to 10 years. The pastor steadfastly insisted he was not guilty. 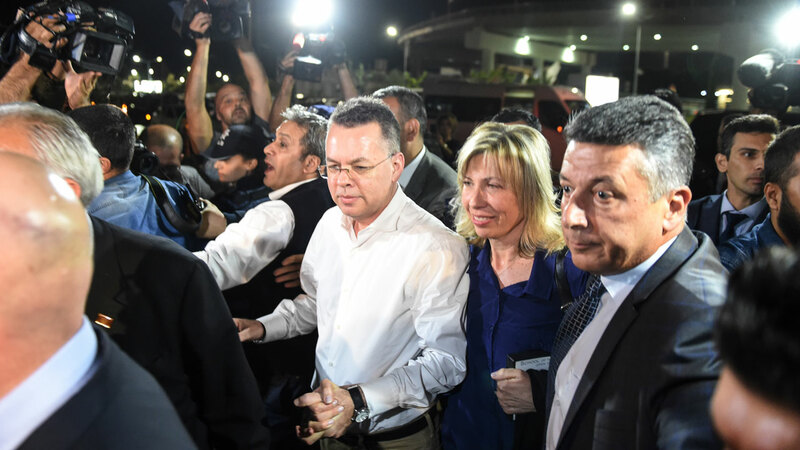 Trump had pressed Ankara to release Brunson, an evangelical Presbyterian clergyman who lived in Turkey for nearly half his life, initially moving there in 1993 as part of a missionary program. “I think he’s going to be in great shape,” Trump told a campaign rally in Ohio on Friday. Both Erdogan and Trump have pressed Saudi Arabia to explain what happened to Khashoggi. Now that the Brunson issue has been resolved to Washington’s satisfaction, it could help the two sides coordinate their Saudi policy more closely.